It’s a challenge to turn your old garage into a sleek and modern industrial space that is functional, cool, and fun. Even though your local neighborhood building supply store is easily accessible, they offer cheap cabinets. If you’re looking for stylish, high-end garage cabinetry that is functional and durable, then you’ll want to make an investment in laminated wood or metal garage cabinetry. The challenge is choosing which one is right for you. Durable, high-quality garage cabinetry can be an investment. Laminated wood cabinets are less expensive than metal cabinets. Laminated wood cabinets, however, won’t last as long as metal cabinets. They also are not able to withstand certain environmental atmospheres as the laminated wood is often porous and can lead to moisture build up inside the wood. 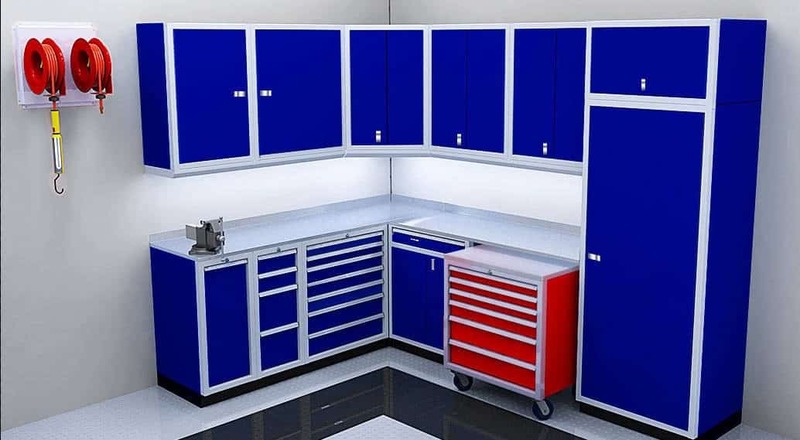 If you prefer more of a stylish and organized garage, then metal cabinets offer the most options and customization. Many of our customers choose colors to match the cars they own, or to compliment their cars. They also choose colors to match their favorite sports teams and other hobbies. Laminated wood modular garage cabinets often have only 3 or more color choices, but all are white or brown. The options for customization can be limited. Garage storage cabinets can be installed in your garage, so you’ll have more space for your tools and other equipment. If you are looking for a functional garage that you’ll spend a lot of time working in, then aluminum metal garage storage cabinets would be a good option. Moduline Aluminum Cabinets are modular so you can easily bring your garage storage cabinets with you if you ever move. If you are trying to decide your aluminum metal garage cabinet color choices and layout for your garage, then contact Moduline Cabinets for a free consultation.